According to a new survey fielded by TNS Worldwide, Americans are in favor of celebrating and recognizing these special moments. It’s these memories and mementos - - shared in the form of photos and videos demonstrating the value of awards and recognition -- that the Awards and Personalization Association is seeking for their first-ever “What’s Your Favorite Memory-Making Season?” contest designed to celebrate and reward memories of all kinds. “As we celebrate so many athletes on their road to Rio and so many children look to these athletes as their heroes, we want to recognize the early memories that sparked a desire to hone skills, try harder after a loss and topped off a winning season, and created life-long lessons that are still used on and off the playing field,” said Mario Scarano, president of the Awards and Personalization Association. Timed with the pageantry and podium-worthy performances of the Olympic Games, the Awards and Personalization Association is seeking the most unique, provoking and heartfelt memories across all youth sports that best personify participation in the youth athletic experience. 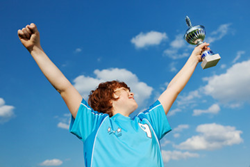 According to recent research fielded by TNS Worldwide, more than 70 percent of Americans support recognition of outstanding achievements in sports via trophies and other awards and nearly 2/3 (65%) approve of recognizing children for participating in organized sports. “Recognizing that children have varying levels of expertise and development sets the foundation for a positive experience in youth sports, and ultimately, creating a “can do” attitude and lifelong learning,” said Greg DellaBadia, immediate past president of the Association. From now until September 20, athletes, parents, youth sports fans, coaches and others are encouraged to enter, by either submitting a photo or video of the athlete, their coach or athlete describing their favorite memory from a season and how it impacted their life. Submissions should include award presentations, end of the season recognition ceremonies or team parties with their trophy or other award and should highlight how the season impacted them, how they were recognized by the team or as an individual, and what it meant to entrant. Entries should include the #memorymakingseason must be no more than 250 words or 2 minutes in length and can be submitted at http://www.facebook.com/recognitionisrewarding. The top five submissions will be recognized with an award and $250, and the grand prize winning individual receiving $1,000 and contribution to a local sports organization of a custom awards program for their team. For more information, visit,http://awardspersonalization.org/ForConsumers/ParticipationAwardEducationProgram.aspx.